Jacky Alciné (7 Mar 2019): Twitter doesn't have a concept of friends, everyone is subscribed to one another's feeds; that's all. Facebook's web UI has an "Add Friend" button (originally possibly "Add as Friend", 0:22 The Social Network trailer). Clicking it sends a friend request. 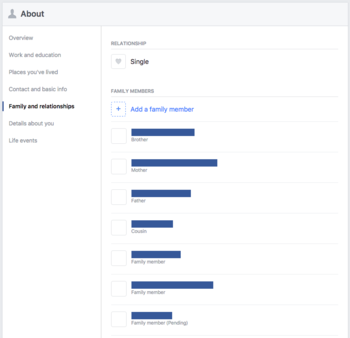 Example of the Family & Relationships configuration page on Facebook. When a friend request is sent on Facebook, the recipient will have to accept it to create a two-way connection. 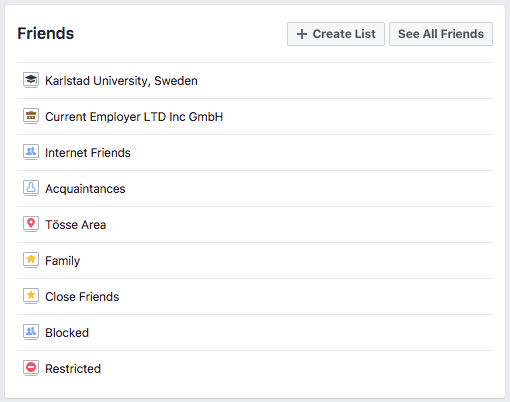 Connections can optionally have family relationship data attached to them. Facebook will automatically have two people who became friends follow each other. This is a separate thing and does not have to be reciprocal/mutual. Either person can go and manually unfollow the other again without losing their friendship status. Even if both unfollow the other this has no repercussions. Being friends means Facebook Messenger can be used without having to whitelist the other person and other communications such as invitations for events become more streamlined. Facebook also by default allows two friends to write on each others's walls.